Inform Your Subscribers About Any Updates REAL TIME! Hey! Do you want to inform users about any updates REAL TIME even if they are not on your website or subscribed to your mailing list? This can be done by push notifications. It works great whether you have a regular blog or ecommerce website. When visitors land on your website, there will be a popup notification to ask them if they like to receive updates about the website WITHOUT the need to enter any of their personal details such as email addresses. One of the apps that I recommend is PushCrew. With push notifications, you don’t have to wait for your users to open their email inbox to get a communication. It will be delivered right on their browser. Real-time. 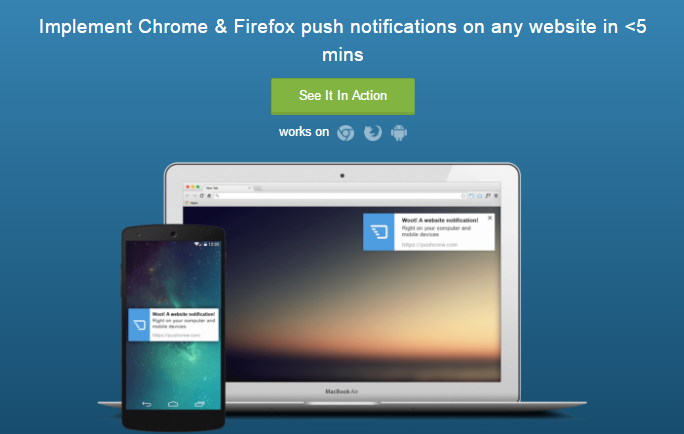 Push Notifications are delivered right on the browser. So you can engage your subscribers with your communication even when they are not present on your website. Push Notifications are clickable. So you can send people directly to any URL on your website (or outside your domain) based on their interests / actions on your website. This is how it looks like when a visitor visits your website with the PushCrew app installed onto your website. First time visitors will see this pop-up. Once they click on “Allow”, you will be able to send push notification whenever you want. Your subscribers will be able to see this on their computer when you pushes a notification and click on it. This is very useful for sending information to your subscribers when you have new offers, updates or anything that you want to share with your subscribers. Go ahead and install PushCrew on your website today! Marketing effectively isn’t all about the size of your budget; it’s about your audience. Even though you may be faced with a shoestring (or even a nonexistent) budget, one thing you do have is time. You most certainly can market your business on a shoestring, as long as you’re willing to put in the time and effort. Let’s jump right into it. Regardless of your budget, understanding your audience is at the core of being able to market your business so that you attract the right audience. Your blog is the base from which all action should take place. It doesn’t matter whether or not you pay for your blog; everything you do should be on your blog before you post it anywhere else. Sign up for a Facebook Page for your business, then announce every new blog post, every new bit of information on that page, always linking back to your blog in the process. Pinterest is hot right now. If you can find a way to incorporate pictures for each new blog post, you can promote yourself on Pinterest. Set up your profile and fill it out completely. Seek to improve it at all times, cross-pollinate information from your blog to Linkedin.com. Ask people to recommend you and endorse you. Do the same for others. Twitter is a social network in which you can post short 140 character updates often, throughout the day, without irritating others like you might by doing the same thing on Facebook. Use it often to remind people about your blog. There are literally thousands of Yahoo Groups that you can join. Join groups that are comprised of your ideal audience members. Using a verified email account you can post ads for your business. Choose the right category for your business. Posting between 4pm and 9pm is the best, according to Craigslist. Find forums where your audience participates and make smart comments that show your knowledge about the topic, letting your signature line speak for itself. Most of the time local media can’t find enough stories. Be a story – send them a press release about your business and they’ll be glad to cover a local success story. There are directories all over the Internet; use them to list your products and services. Your website is already in place, so use it to its full potential by ensuring that it properly represents your business in full. People like listening to experts, so become the go-to expert in your niche. Before you know it more people will come to you and ask you more questions, which you can use for more blog posts, and to create new products. It will cost you time, and perhaps gas money, but the more involved you are with your local community, the more business you’ll get. 15) Write Guest Blog Posts Find niche sites that speak to your audience and offer to write original blog posts for them on a regular basis. All you need in return is a link to your site in your bio. Kindle makes it simple to publish, compile and edit your old blog posts into an eBook for your audience. Give it away free or sell it for 99 cents. When you produce something new, always ask others to review it for you on their blogs and websites. Use your blog, social media, and/or Youtube.com to promote a contest with the prize being free product. Get people to vote on the winner, which will encourage sharing among the participants. “Free” can be worth a lot these days. Create a great report – such as an overview of your niche – and give it away in exchange for email list sign-up. Make it simple for other people to share your website, blog, or newsletter by adding social share buttons. Utilizing emails, questions found on forums, and other sources, create a weekly Q&A blog post. You can take just one question at a time and make an entire blog post built around it. Make your Q&A posts into a video, or make any past “how to” blog post into video. Sometimes people like to see things in other forms. Do your Q&A on Google+ Hangout On Air. Doing a live event can be scary, but it can also be a great way to get new connections. Search for and answer questions within your niche by people on Google+. When someone asks a question you can answer on Facebook. A lot of people will pose short questions on Twitter – be ready to answer them either in public or directly. Quora is a free service where you choose at least five topics and then contribute to questions and answers that are relevant to the topic. Search for forums about your niche and join those where your audience participates. Then become the resident expert. Find groups of both your audience and direct competitors and join them on Linkedin.com. Do not self-promote, but be free and open with your answers and questions. Linkedin.com allows you to create your own groups, so create one in which you can pose and answer the questions you want to, as well as use to promote your blog. On Facebook you can create many types of groups, both private and public. Create both so that you can converse with your audience and colleagues. Find groups on Facebook that are both networking and marketing worthy. Join them, and participate actively. Create videos and put them on Youtube.com, and also embed them into your website. Create blog posts that spotlight gurus within your niche. When you mention someone, link to them as well. You might even end up with a comment from them, too. You don’t have to write all your own blog content, you can curate relevant content from others (as long as you link back to their content in full and only write a blurb about their content). You can use free services like Skype to record interviews as a podcast. Post them on your site and to iTunes. Repurpose the expert interviews into an eBook. You can make individual eBooks, and then at the end of the year compile them all into a larger volume. Likewise, you can transcribe all interviews into blog posts. Some people would rather read than listen. Give your audience options for how they can get your information. Gather up some experts and host a round table on a popular topic. While you’re limited to the participants on the round table, the On Air part is unlimited. Skype is a great way to record an interview both in video format and audio format, then later post that recording Youtube.com, your site, or in some other format. Do you know four or five experts? Ask them to participate in a weekly expert panel where everyone answers the same question. Be the expert answering the questions for someone else’s weekly expert panel. If you’re stuck for things to say on your blog, look no further than your email for questions from your clients. You can take one question and turn it into a blog post. SurveyMonkey has a free version that you can use to do a survey of your audience. Facebook and Linkedin.com are both good places to post your survey. Use everything you do as blog fodder. Blog before, during and after any significant event, and include a survey. If someone comments on your blog posts, always comment back. If someone comments on any social media account on any post, try to comment back as often as you can. Create some guidelines for guest blog posts on your own blog, and actively solicit guest posts from experts. It can be frightening to speak, but speaking locally can get you written up in the paper, and give you plenty of blogging material. Whether local or national, becoming a source to the press can get you free media coverage. Check out HARO for more information. Don’t just do everything yourself. If you have a staff, or use contractors, let them also participate in expert panels on your company’s behalf (subject to your supervision, of course). This doesn’t seem free, but add some amount to the price of your products and services so that you can give 10 percent annually to a charity of your choice. Write press releases about it and blog about it. Make it more of a big deal by having your audience vote on which charity will benefit, starting three months before the donation. If you’re not submitting a press release each month, you’re not doing enough. Local events can get you some online link love. Everyone who goes to the event will blog about it, and of course you will too. And, there’s that press release you can prepare and submit. Join Meetup.com and find local events to attend. You can become recognized as an expert just by attending and interjecting your knowledge. When you post a testimonial, you usually get a nice link back to your site; sometimes you get your picture published too. Likewise, getting endorsements and testimonials is a good way to boost your business. There are some free apps that you can brand for yourself and offer to your audience. It’s a great way to brand your business. Seeing special offers and sales that available only to new customers can be rough on current customers, so why not offer them loyalty discounts for sticking with you? When someone complains, never ignore it; deal with it immediately in a way that feels like a win for the customer. You can open a free Slideshare.com account, which is limited, but provides you with a good start. It’s a great way to share your knowledge. By using Google Hangout or other Webinar Software such as Any Meeting you can teach others how to do something in which you’re an expert. As a known expert you can create an award, make a widget, and give out the award yearly to someone who stands out in your industry or niche. Want to host an event but have no cash? Ask for sponsors. Often if you get sponsors you’ll not only be able to put on an event that’s free for participants, but you’ll also come out with a profit. An e-Newsletter is a little different from your basic email list. This is a planned periodic newsletter that you can even sell advertisements in. You can do this easily by email using technology you already have such as Aweber.com. Or if you don’t have that yet, you can use Mailchimp.com, which is free up to 500 subscribers. Don’t miss out on opportunities to upsell when someone buys something. Your thank you page or thank you email is the perfect place to pitch a discount on another item, or even promote an affiliate product or service. By creating an affiliate program you create an army of marketers who can help your website rank higher on Google Search. Plus, you’ll make more sales. Always be ready to help others online and offline. It’ll pay you back in more ways than you can imagine. Article marketing is not dead. You can still find reputable places to post your articles. Keep filling out and building up your Google+ page. The more your profile is perfected, and the more you perfect anything related to Google, the higher you’re going to rank in their search engine results pages. Webmaster accounts are yet another link back to your site. Plus, the information you can learn from each is invaluable for you to boost your page rank. On page SEO refers to everything you do on every page of your website in order to help search engines find your site and rank it. Don’t overlook the importance of this. Off page SEO refers to everything you do to promote your website off your site, such as participating in social media, article marketing and so forth. Movies and slideshows are a great way to showcase your products & services. People like to see what they’re getting. Whether online or offline, networking events can boost your business awareness exponentially. Don’t just meet someone and not connect. Connect on social media, connect in email and then keep those connections going. When you’ve met a promising prospect, drop them a personal note instead of a canned note. You’ll get a better response. Industry publications, both online and offline, need contributors. It’ll only take some time to write them, and submit them, but the payoff is well worth it. Your local press needs people they can call on regularly for quotes. Be that person. Contact them anytime there is a story in your local paper with expert commentary. Before you know it, they’ll call on you. Instead of just doing a random Youtube.com video, why not start a regular show. Ensure that it’s part of your niche and set up a regular schedule. Guests or no guests, you probably have something to say about your topic that can be put in a weekly podcast. Social media profiles, bios, signature lines, business cards, your URL should be everywhere. Sure, your site will be picked up eventually, but why not submit it to them manually to hurry up the process. If you find any contests to enter, do so, and then try to win. The more you win, the more you have to blog about, and the more people will see you as an expert. Remember that the word always gets out. If you provide excellent customer service (even if you make a mistake here and there) you’ll be seen more favorably. Do right by your customers. A joint venture partnership can expand awareness of your business, and encourage others to want to work with you too. 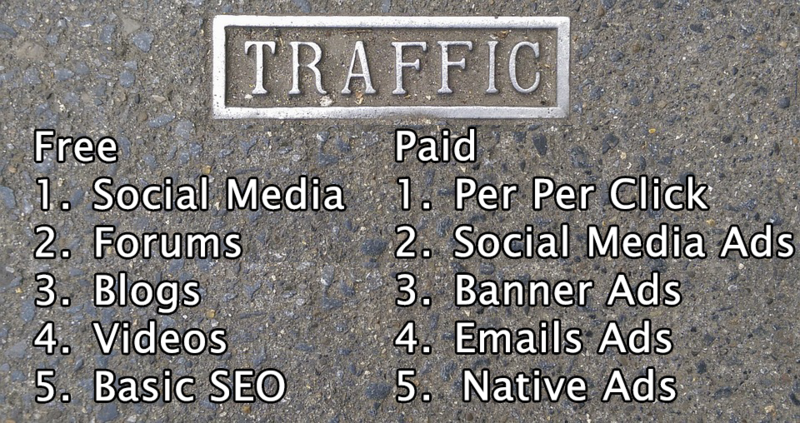 If you have no money at all, you can still create a website with one of these services. 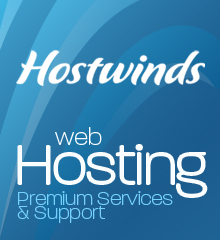 It’s not recommended for long term, but it can do the job for the time being or for a limited-purpose site. Whether you have an online business or offline business, your Google Business Listing is important. Same thing – the more search engines you’re listed with the better. You don’t have to have a bricks and mortar business to be listed with Yelp! This is an excellent way for you to get started marketing your business locally and in person without increasing your budget. Ask friends, relatives, and customers to tell everyone they know about you and what you do. Give discounts or cash to those referrers when you get a paying client. This is a good use of those free business cards. Every single time you send out an email, it should include a signature that has links to your blog, social media sites, and a nice signature and tag line. Past clients are a good source of testimonials and referrals, but they can’t provide these things if you don’t ask. If you want your past clients to use you again, offer them a hefty discount to come back. Every new customer should get at least a free 15 minute consultation. It will make them feel as if they can trust you more when they can talk to you. Whether on Google+ or via a webinar, hosting a big event and then giving away a huge prize package consisting of your products and services will make waves. If you know businesses that already market to your audience, contact them and make a deal to cross-promote each other’s products and services. This works best if you both have affiliate programs. No matter how much money you make now, utilizing these free online marketing ideas will increase your bottom line. Marketing on a shoestring budget doesn’t mean you’re limited in what you can do. It also doesn’t matter if you do have the money to spend – most the ideas above are still good ideas to keep your marketing budget small and your business booming.